Jim is an alumni of the College for Creative Studies and has been painting for over 30 years. His abstract oil paintings are in the collection of Richard Manoogian, a top international art collector and former Chairman of the Detroit Institute of Arts. Jim has had numerous exhibits around metro Detroit including the Scarab Club of Detroit, the Grosse Pointe Art Center, Anton Art Center, Ann Arbor Art Center, the Birmingham Bloomfield Art Center and Aedis Design. He has also exhibited in the prestigious Michigan Fine Arts Competition. Early in his career he also had the opportunity to exhibit at the Rental Gallery run by the Founder's Society of the Detroit Institute of Arts. He was selected as the first "Artist of the Month" by John Hallmark Neff who was the curator of modern art for the Detroit Institute of Arts at the time. 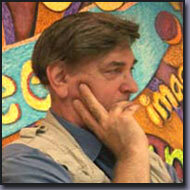 Jim has won numerous awards for his paintings which are detailed on his website. He is a founding member of the Image and Arts Council of Troy and was instrumental in getting the group's art seminars shown on local cable access TV. He was able to participate in studio space at Ford and Earl (pictures below) where he worked on his own projects as well as Public Art mural projects and "Art Unhinged" - the Kmart Headquarters recycled doors project. He is a primarily a colorist, with subjects ranging from geometric abstracts to carousel horses. Jim sells to corporate and individual clients. He also offers art rentals and art instruction.